A special thanks to The Original Worm for providing Swim Bike Mom with two “worms” to giveaway. The Original Worm is the multi-tasking body roller. I love the portability of taking the Worm with me to races and in the car. It combines the benefits of therapy balls & a foam roller. Product info: The Original Worm provides trigger point release to combat stiffness, pain and stress in muscles and joints. It is also a very effective recovery aid. The Original Worm is made of solid rubber balls encased in a durable, hand washable neoprene covering. Its unique design safely molds itself to your body’s contours with comfort and support. The Original Worm is completely portable, offering you a therapeutic session whenever and wherever you wish. Targets back, glutes, hip flexors, neck, feet, shins, calves and arms. 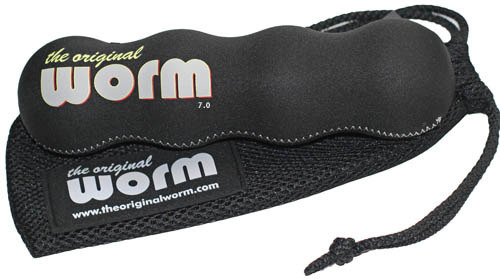 The Original Worm is also a wonderful posture aid and neck & head support prop. Available in pink & black. Standing at work today, wishing I had a foam roller with me, quads are screaming. After my killer olympic lifting session last night, I could really use one of these. I just took my large foam roller on a business trip. I would love a worm to travel with (takes up a lot less room) and to roll my sore feet after long runs. Plus I love the idea of using it on my back when driving! I have a love hate relationship with the foam roller. I have never heard of the worm, I would love to try it!